The question to me was absurd! It is so close to my heart, and is now shared on television shows like Alaska the Last Frontier and just about any other show about Alaska that I thought EVERYONE knew what it was! On the flip side of that, when my sister talks about zombie shows or American Idol, I just stare with a blank look on my face. My first reaction was to say that homesteading is living off the land. Foraging for fresh fruits and berries, growing vegetables, growing your own meat or hunting for it. Living as close to nature as possible. Using herbs and essential oils to be healthy and to heal. 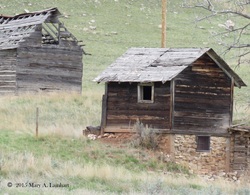 But the more I thought about it….I think there is a little bit of a homesteader in most of us. Living in the city and growing potted herbs on your windowsill. Having some tomato plants growing in pots on your patio. Growing a vegetable garden in your backyard. Visiting the farmer’s market to buy a bushel of tomatoes to can your own sauce. 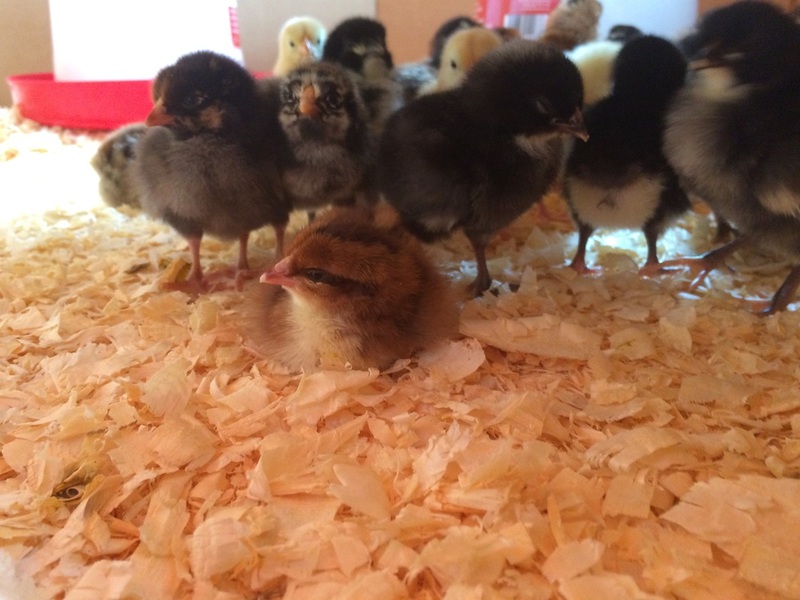 Having some chickens in your backyard for fresh eggs. 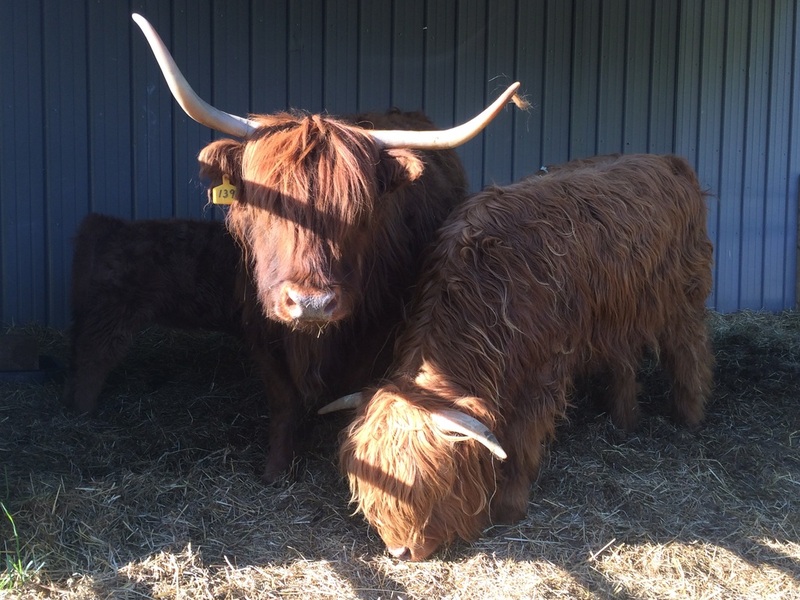 The more I thought about it…Homesteading isn’t as much a way of life as it is who you are. The desire to live more naturally and closer to the earth – as our great grandparents or great great grandparents did. It isn’t an easier way of life, but it is a rewarding way of life. Being more aware of what we put in our bodies and the effects of what it has on us in the long run. Making choices about how we treat ourselves, rather than having the FDA decide what is “safe” or “good” for us. What ARE those vegetables you are buying from the grocery store? Where did they come from? What did they grow in? What was used on them to make them grow? How long ago were they harvested before they made it to your table? How much nutrition is really in them? Were chemicals used on them? What seeds were they grown from? Were they Genetically Modified Crops? Have you ever thought about any of this? What about the meat? Was it grown with hormones? And your milk? How was any of it processed? How many food recalls have you heard about in the last year from production issues or bacteria? Makes you think a little or a lot! I realize we do not all have the resources to live off the land. But there are little things we can do in our daily lives that can make a difference in how we treat ourselves and those we care for. Our goal here at Wild Heart Mustangs is to give you options, to make you think and to try new things. Being good to yourself should be fun. We want you enjoy discovering not a “new” trend….but going back to basics that have endured for hundreds of years to enable a more healthful, happy YOU! Little did I know when we began...the benefits would far exceed anything I expected. 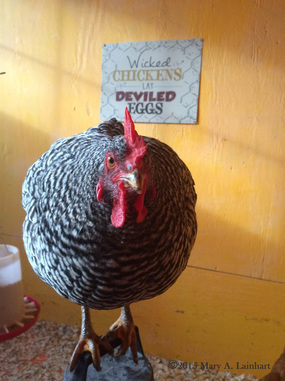 In next month's issue of Wild Heart Mustangs™, you'll read about chickens in the backyard! 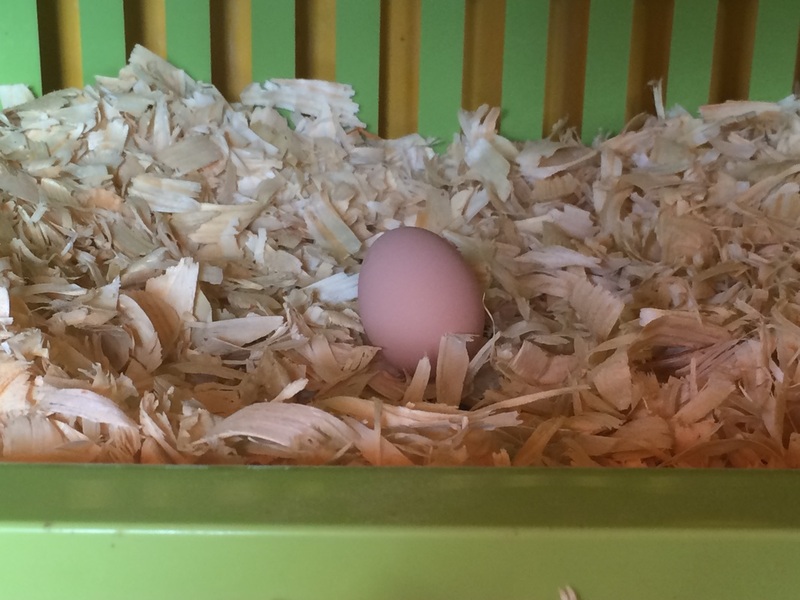 Our Plymouth Rock hen lays her first egg. 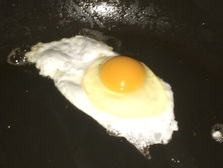 < Breakfast is almost ready - come & get it! 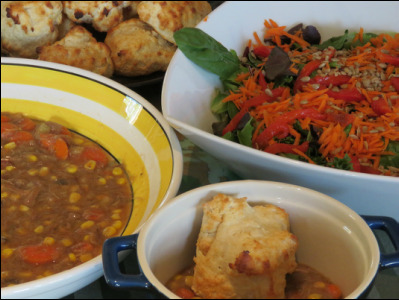 Here’s a homestead twist on the ever popular Chicken and Biscuits. 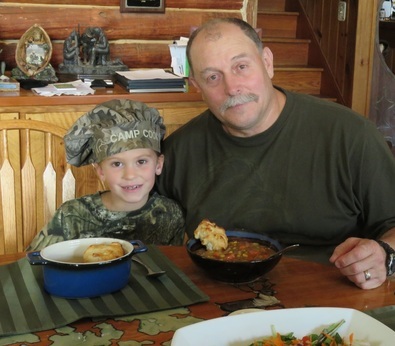 My husband is a third generation hunter, accustomed to living off the land. His sons and grandchildren are following in his footsteps. Nature provides for us; we take what we need and we are thankful. I am not going to lie…I was a bit apprehensive about trying squirrel. I wasn’t raised in a hunting family, as my husband was, but over the years I’ve become a hunter in order to provide food for our table. I’ve learned that a lot of people who’ve eaten wild game didn’t like it. The reason is usually that it wasn’t prepared correctly from the time it was harvested through how it was cooked. I can’t tell you how many times I have heard, “I won’t eat (fill in the blank with any type of wild game) because it’s too gamey!” I can almost guarantee that the game they had eaten was not prepared properly. Wild game preparation should start in the field and continue all the way through to serving it. When my three granddaughters lined up to try this dish, I figured I should too. 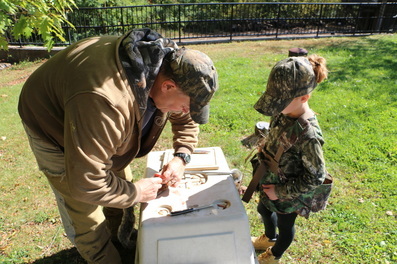 After all, my 8-year-old granddaughter Kamryn not only sat with her Papa when he hunted the squirrels, she helped him prepare the squirrels from field dressing through cooking and serving. I must admit, I was pleasantly surprised at how delicious it was…so delicious that that everyone went back for seconds. I’m not going to lie about one other thing…my husband uses the “season to taste, cook until done” approach to cooking, so this recipe is flexible not just in terms of amounts but in terms of taste. You’re going to like squirrel much better cooked with ingredients you like than ingredients you don’t like. And if you have a lot of squirrel but not a single carrot, you can substitute another vegetable and still serve a tasty meal. There are three important keys to success in preparing this recipe. First, the squirrel has been properly field dressed. Second, the squirrel simmers in broth until the meat is very tender and easily pulled off the bones. We won’t tell you precisely how long because we don’t know the life histories of the squirrels you’ve got in your pot today. The final step of adding strained vegetable pulp into the pot for the final cooking will add wonderful flavor that you won’t find in a can. 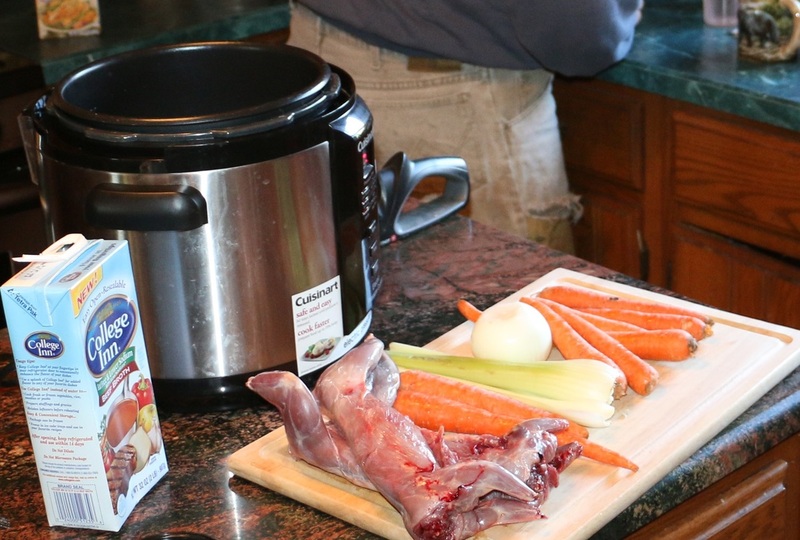 Start with cleaned squirrel, chicken or beef broth, and fresh veggies. An Essential Oil is a liquid (rather than an oil) that is generally distilled (most frequently by steam or water) or cold pressed from the leaves, stems, flowers, bark, roots or other elements of a plant. Essential oils contain the true essence of the plant it was derived from, and are highly concentrated, so a little goes a long way. 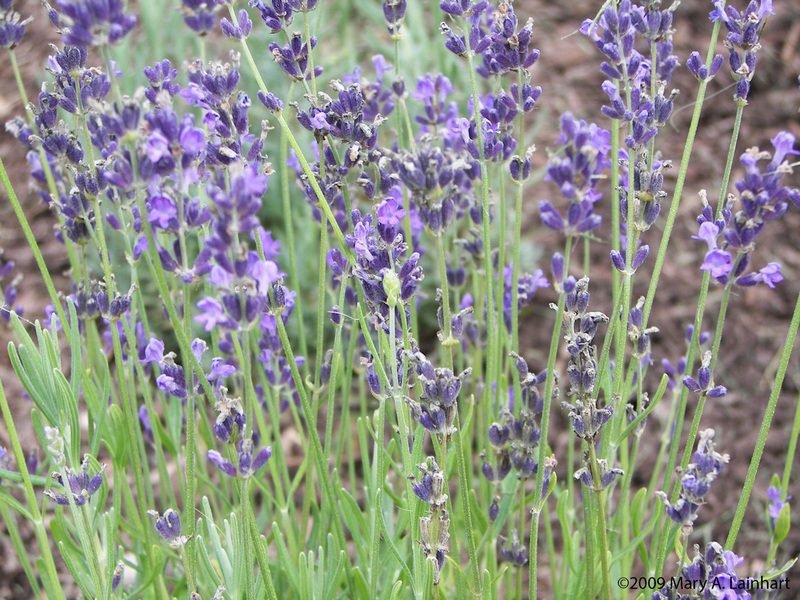 If I could only have one essential oil on hand, it would be Lavender (Lavendula angustifolia). It’s widely known for its calming properties, but is also an antiseptic. Its uses are plentiful. Sinusitis and allergy flare ups – used alone or with Peppermint oil, it can be very effective for helping to reduce the flare ups from allergies and sinusitis.Place a few drops near the affected areas, nasal passages, temples, forehead, back of neck, between the eyes (but certainly not in the eyes or close to the eyes).Test some near your eyes to make sure the vapors are not too intense for your eyes as it can irritate or cause the eyes to water a bit. 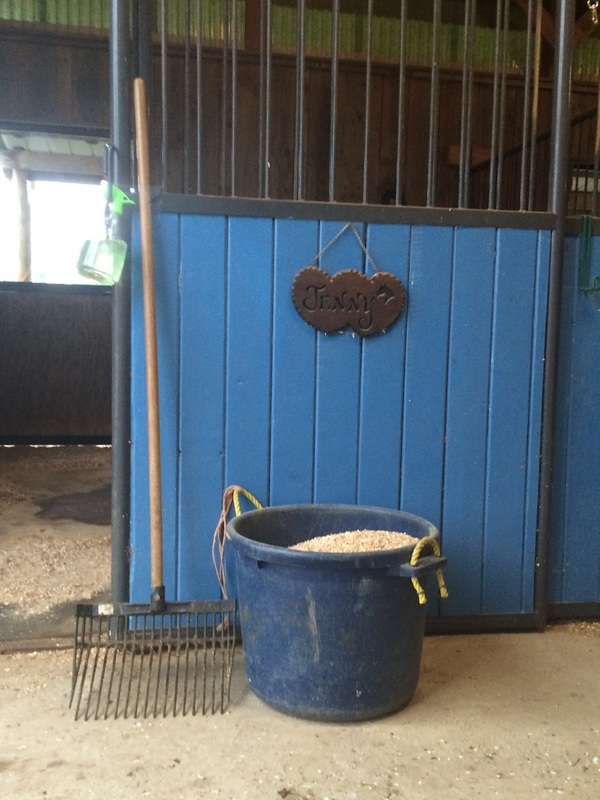 Part of my daily routine when cleaning stalls is to spray them with an essential oil stall freshener. Once all the soiled bedding is removed, I generously spray my lavender/peppermint spray (see right) on the wet spots and let set for a couple minutes. After putting in fresh bedding, I spritz the stall again, plus any empty feeders, for lasting freshness. 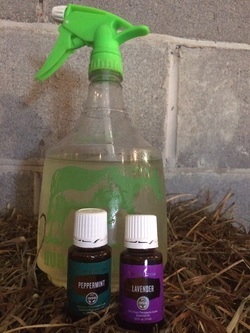 For around the barn, my recipe is this: I keep a 1 QT spray bottle of lavender and peppermint oil diluted in water on hand. 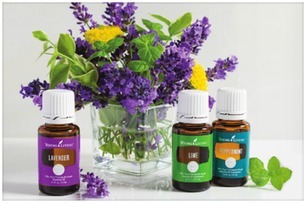 For 1 QT of water I add 10 drops of lavender oil and 10 drops of peppermint oil, then shake well. Note: This spray is also a great to use in the home for cleaning countertops. 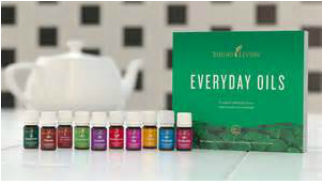 Mary Lainhart is a Young Living OIls independent distributor because after years of her own successful use of them, she's confidant of the purity and quality of Young LIving products.​ The Everyday Oils™ collection is the perfect beginner's kit, containing ten of Young Living's most popular and versatile essential oils. This kit will become a useful part of your day, everyday. ​A Wild Heart Mustangs SPECIAL - this collection is available for 10% off Retail. Special Price for this collection $153.65. Visit the Wild Heart Mustangs SHOP for detailed descriptions of each Young Living oil and blends. Have questions about Young Living Oils products? Ask Mary! after a successful morning squirrel hunting. 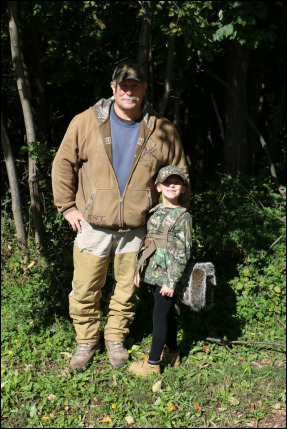 Buck "Papa" Lainhart and granddaughter Kamryn "Pocketknife" Lainhart ​cleaning squirrels they harvested that morning. Put all Step 1 ingredients in a pressure cooker or a large stockpot. If using a stockpot, bring to a boil, then reduce heat to medium and simmer until the meat is tender and easily pulls away from the bone. If using a pressure cooker, cook on high pressure for 35 minutes. Release the pressure when time is up. Place the squirrel meat on a plate to cool, reserving the cooking liquid for Step 2. When the meat is cool enough to handle, use a fork or your hands to pull it off the bones. Cut it in chunks or shred it with two forks to the size and consistency you prefer. Using a wire strainer, strain the broth from the pot or pressure cooker into a large saucepan. Press the cooked vegetables through the strainer with a spoon and scrape the resulting pulp into the pot. Discard anything that didn’t go through the strainer. Place the pan on the stove over medium heat. Add the bay leaf and Step 2 vegetables (potatoes, carrots, onions, celery, etc.) to the pot containing the strained broth and vegetable pulp. Cook until the vegetables are tender (to your preference), about 30 minutes. Put butter and/or olive oil in a large skillet and heat over medium heat until the butter melts. Add the meat, lemon pepper, salt and garlic powder and sauté until everything is well-combined and coated with the seasonings. Transfer the sautéed meat to the broth and Step 2 vegetable mixture. Add the Step 3 vegetables and cook over medium heat until the vegetables are cooked to your liking. Add the cornstarch or flour mixture to the pan. Cook and stir it until it thickens to your liking – we like a gravy consistency - approximately 5 minutes. he Wild Heart Mustangs SHOP.